After describing the investor who might benefit from selling cash-secured puts, this segment outlines the mechanics and uses hypothetical examples to lay out possible outcomes. Who Should Consider Selling Cash-Secured Puts? An investor who would like to acquire a position in a particular security, but is willing to wait for it to trade at his desired price. Have you given your stockbroker an order to buy a security at a specified price? If you have, you have participated in a waiting game. The stock will not be purchased until it trades at or below your limit price. Instead of waiting for that to happen, you could have sold a cash-secured put. A premium (the price of the option) for selling a put option would be paid to you for accepting the obligation to buy a stock that you want to be a part of your portfolio at the price you select. This strategy is used by large portfolio managers as well as individual investors because it "pays" them for assuming the obligation to buy a particular stock. In other words, certain investors who are considering buying a stock (or more of a stock they already own) may want to sell cash-secured puts. Selling a cash-secured put involves selling a put and depositing the money for the purchase of stock at the brokerage firm (generally, this money is invested in short-term instruments). The purpose of having the money in the account is to assure that funds are available to purchase the stock should the put be assigned to the account. Generally, the buyer of the put will exercise the option should the underlying stock drop below the strike price (the price at which the seller of the put has agreed to buy the stock). If the stock does not drop below the strike price by expiration, the premium will be retained by the seller and another put may be sold. 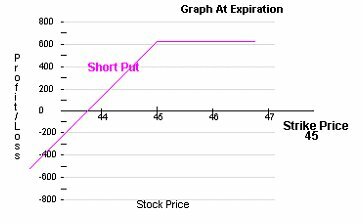 By selling the put, the investor receives the premium while waiting for the stock to decline to the strike or price at which he is willing to own it. Therefore, the cash-secured put is a strategy that may help you accumulate stock at a lower price than where it is currently trading (net cost = strike price - premium). Stock ZYX is a stock that an investor would like to own. Currently, it is priced at 47.125, but he feels it would be a good buy at 45 and that the stock could reach that level within the next two months. The investor can either place a limit order to buy ZYX at 45 or an order to sell ZYX puts with a 45 strike. Remember, by selling the puts with a 45 strike, he has the obligation to buy the stock at 45 should the buyer of the options exercise the right to sell ZYX. The investor would sell one put for every 100 shares of stock he was willing to purchase. Let's compare these two strategies. Commissions and taxes have not been taken into consideration in these examples, although they can have a significant effect on your returns. At expiration, the stock will either be above 45, in which case the investor will not buy the stock, or below 45, in which case he can expect to buy the stock at 45. The outcome of each scenario is explained below. By selling a cash-secured put or entering a limit order to purchase the stock, the investor will not be able to participate in a rise in the price of the underlying. If the puts that were sold expired without being assigned, the investor could sell another 5 puts if he were still interested in owning 500 shares of ZYX. Using a limit order to buy ZYX, the breakeven would be what he paid for the stock. Selling the put lowers the breakeven which is the strike price less the premium, 45 - 1.25 = 43.75. Having sold the puts with a 45 strike, should ZYX decline considerably the investor still has the obligation to buy the stock at 45. However, he does have the cost reduction of the 1.25 premium received for the sale. If a limit order had been used to purchase the stock at 45, he would begin losing money as soon as ZYX dropped below 45 (the breakeven). The investor may be in either Situation I or II. With a limit order at 45, he may or may not buy the stock. There is no guarantee that he has bought ZYX at 45 until it trades below his limit price. If puts were sold, he has the obligation to buy 500 shares of ZYX, and he may be assigned (have the stock "put to him") or the puts may expire worthless. Either way he retains the premium. There is another way to use the cash-secured put. For this example we will assume ZYX is trading at 65. Once again, an investor would like to own ZYX, but not at this level. He thinks that ZYX would be a good buy at 60. The previous example showed the sale of an out-of-the-money put (put strike price below current stock price) which required the stock dropping to the strike price of the put before the stock would be purchased. An alternative approach is to sell an at-the-money put (put strike price and current stock price are equal) or an in-the-money put (put strike price above current stock price) in which the premium from the put assures a target net purchase price for the stock. By selling an in-the-money put it is more likely that the put will be assigned and the stock will be purchased. The owner of an in-the-money put is likely to exercise his right to sell the stock above its current value, therefore, the seller of the put will be obligated to buy the stock. Selling the cash-secured put at a strike price of 65 for 5.625 allowed the investor to buy ZYX below the 60 limit at a net cost of 59.375, even though ZYX never traded there. If he had used a buy order at 60, he would not own any stock. Even if ZYX dropped through his 60 limit, the cash-secured puts supplied some downside protection. Since the net cost is 59.375, so is the breakeven. Had ZYX been purchased with a limit order at 60, the investor would not have any downside protection, and would begin to lose as soon as it dropped below the limit order cost. If a limit order was used to buy the stock, he may or may not own it. However, had the put been sold he might be put the stock and own ZYX at a price of 59.375 (65 strike price - 5.625 premium). Selling a cash-secured put is a strategy that allows you to be paid a premium for the obligation to buy a particular stock. Currently, there are short-term options listed on more than 2500 stocks and more than 1300 of those stocks also have LEAPS®, Long-term Equity AnticiPation Securities™ which are simply long-term stock and index options. The premium received for selling a put gives you some downside protection by lowering your breakeven while placing no limit on how high the stock can be subsequently sold. This strategy may also give you the opportunity to purchase a security for a lower cost than it is currently trading. In other words, someone interested in investing in stock may want to consider selling a cash-secured put as a means of buying that stock.